More decorative blocks will be coming over the next few days but getting out the first ready pass on tables and chairs (definitely more chairs coming). Fixed AO light blending to be correct for blocks that don't fill the entire cube. Hookshot can now attach to the new wood blocks. I don't really understand what Michal is saying, but his point is clear. 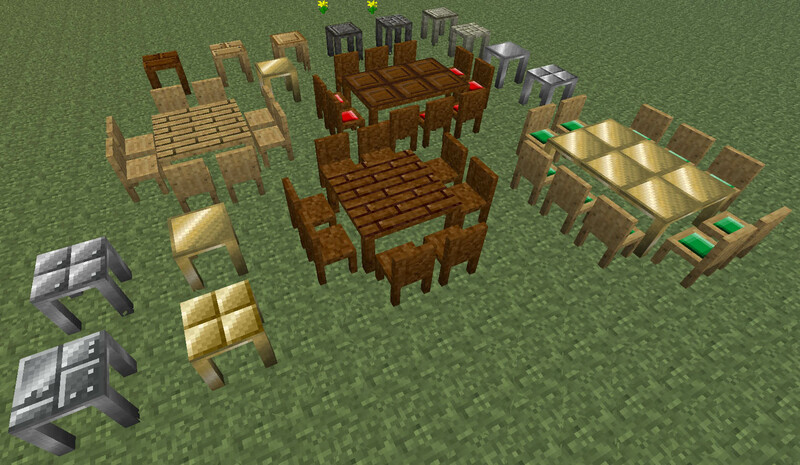 Aside from that, Cryect, what will you be adding when you're done adding the fancy pack items? I really love AdvntureCraft it is amazing. But one of the things that I think should be added is more control over the npc's. They should be able to say more than one line and they should be able to follow you or follow a guided path that you set up. I think that those would be really cool things to add. Thanks for everything and great work!!! So, after you update to 1.4, I'm guessng that by adapting the wolf coding, NPC progress will come along faster than it would have before? When you get around to it, of course. What are you doing after the decorative stuff anyway? Hey, Cryect, you must make the bookshelves to allow you to fill them with books and make books readable and writable. You can make so that you may input a text at a bookshelf.